This summer one of my e-mail groups did a virtual sewing room tour. Since my area was not presentable, I did not participate. The studio is now presentable, so I’ll take you on a tour. I’m using what the builders called the den or family room as my quilt studio and office. It is in the front of the house and entry into it is via the garage, kitchen and living room. This first picture is looking diagonally across the room from the living room door. I’ve created a working/sewing triangle — my work computer is on the front wall under the quilt, my personal computer is on the garage wall and across from them is my sewing machine. Also on the garage wall is a folding craft table with only one side raised. This is my cutting table. The bookshelf, below the edge of the desk, holds the various computer parts and pieces that I don’t need access to on a daily basis. Moving into the room and toward the front wall, is the view diagonally across to the garage and kitchen doors. The room is a bit deeper, than this picture would lead you to believe, but I’ve got my large ironing board and a shelving unit temporarily in the corner behind me. The white tables are temporary as well. I had friends over this past weekend to sew and they all needed a space to setup. 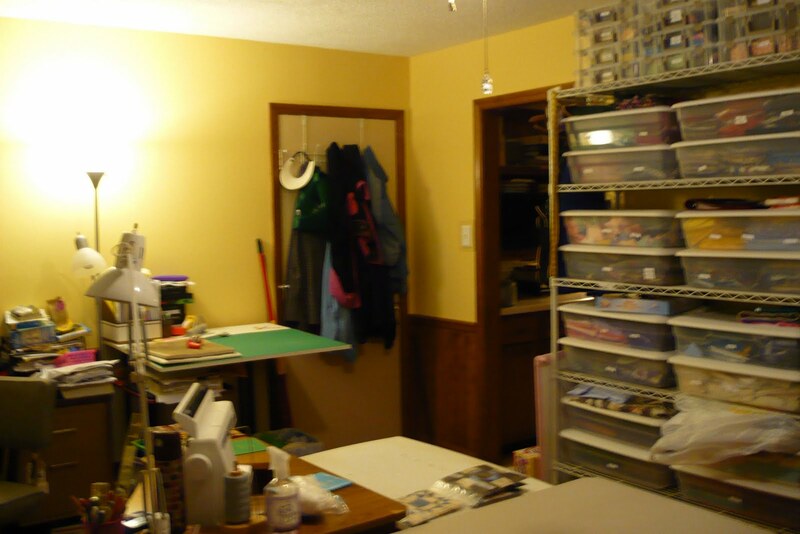 Also from this view is one of my two main sets of shelves with my fabric in bins. A better view of the shelves and looking into the living room (where I was standing when I took the first picture). Again I’m not in the corner as now I’ve got the desks behind me. There is a short bookshelf for my quilting books and to the right of the door is a chest of drawers. This is where the orphan blocks go and I keep my music fabric. The guest chair is in front of the chest of drawers currently, but usually it’s closer to the sewing table. Finally, from the kitchen and garage door corner is a view of the design wall, the big ironing board and a hopefully temporary set of shelves. The ironing board is in front of the design wall so there was room for the extra sewing tables. It’s final home will either be up against the front window or along the back side of the sewing tables. Well, that’s the tour. There’s still work to be done — get real window treatments, clear that black shelf off and recover the chair along with a second one currently stored in the garage. I just hope this clean room doesn’t stifle my creativity.